“Platform” is the Parrish Art Museum’s ongoing program in which artists are invited to respond to the site of the museum through temporary projects and public events. Internationally-acclaimed artist Josephine Meckseper, known for her film, photography, and installations that conflate art objects with commodities, responds to the museum’s architecture, location, and collection with five large-scale sculptural works installed in the outdoor gallery, lobby, and permanent collection galleries. Blending materials and concepts from advertising, retail, and visual art, Meckseper questions the underlying power dynamics that shape prominent aspects of our culture. Her works are placed throughout the museum on a subtle arc that begins in the outdoor gallery with two vitrines—inspired in part by Mies van der Rohe’s German Pavilion for the 1929 International Exposition in Barcelona. The contents contained within—original sculpture and mass-produced objects—might be construed as fine art or consumer goods. 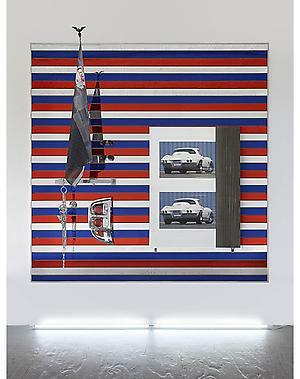 Automotive culture and its association with oil and global turmoil are themes recurrent in Meckseper’s work. Installed in the lobby, Sabotage on Auto Assembly Line to Slow it Down (2009) incorporates car tires, a conveyer belt, two of the artist’s videos on stacked monitors, and mirrored tiles that reflect the vehicles in transit along Montauk Highway. Influenced in part by the car-centric film Weekend (1967, dir. Jean-Luc Godard), Meckseper alludes to the car dealerships just a short distance down the road and draws attention to the often-discussed traffic that marks the influx of summer visitors. The cinematic quality of the moving vehicles contrasted with the pastoral landscape surrounding the museum is framed within the work’s mirrored surface. In the collection galleries, Meckseper further upends expectations through the placement of Crow (2011), with its prominent Jeep insignia, adjacent to John Chamberlain’s crushed car sculpture Tambourinefrappe (2010). Her use of commercial slatwall panels as an artistic medium for both Crow and Corvette (2011), the latter installed among three works in the “Collective Conversations” gallery, is a departure from traditional materials of painting and sculpture, but a clear reference to Minimalist and Modernist aesthetics. Throughout the building, Meckseper approaches this project as an exhibition without a designated gallery, generates unexpected conversations within the collection, and highlights the museum itself as a display platform.